PROGRESO — Just right before summer begins, in the area of El Trébol, south of Yucalpetén’s harbor, the facilities of a tourist marina are being enlarged, which causes problems for fishermen and boat owners when departing. 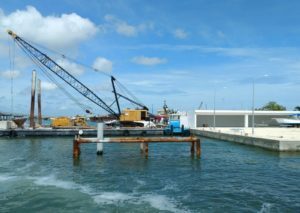 According to El Diario de Yucatán newspaper, El Trébol area already has several marinas; however, there has been non-stop construction work to enlarge and repair them. Not only are they building up docks, but also ramps, sheds, and offices, as well as wooden piers for docking boats and yachts. Since last week, wooden structures have been installed due to the aforementioned wharves. Nonetheless, according to coastal fishermen and seafarers who asked not to be identified, these new additions to the zone will obstruct the flow of boats. Last Sunday, there was an ‘example’ of what will happen during the summer, when there is more movement in the touristic sector; several boats had trouble getting around this area due to the structures being placed in that marina.